The Missouri S&T logo represents us at the very highest level and is vitally important to our brand. It acts as a signature, an identifier and a stamp of quality. It is, and should always be, the most consistent component in our communications. In order to maintain this consistency, a few simple guidelines should be followed. Note: The Missouri S&T logo should never be recreated or typeset. Only official logo files should be used in communications. Official logo files can be downloaded directly here. The Missouri S&T logo should be used on all Missouri S&T marketing materials. This includes all publications like business cards, letterhead, brochures, newsletters, admissions publications, recruitment materials, summer program publications, videos, websites and other materials. Use of other logos or graphic marks to represent Missouri S&T or its academic or administrative units (e.g., a departmental, research center or other unit logo) is not permitted. The campus logos must remain as originally drawn and proportioned, and cannot be modified or altered in any way. The text is a graphic element, not a typeface. Do not use the logo or any part of it in a sentence. For general web or digital use, please use PNG files. For media or professional printer use, please use EPS files. The primary color option for our logo is PMS 356. It’s intended to be used on lighter backgrounds and images in order to maintain legibility. The logo can appear in Black only for blackand- white and grayscale scenarios. Make sure there is adequate contrast when placing the logo over images. Often, a shape is used behind our logo to make sure there are no legibility issues and to draw attention to our logo. To maintain full legibility, it is recommended that the minimum size of the logo be at least 0.75 inches wide for print, 64 pixels wide for screen. There is no maximum size limit, but use discretion when sizing the logo. It should never be the most dominant element on the page, but instead should live comfortably and clearly as an identifying mark. To ensure that clear space is maintained around the logo for legibility and prominence, photos, text and graphic elements must follow the guidelines illustrated here. Use the S&T ampersand as a measuring tool to help maintain clearance on all four sides. DON’T rearrange the placement of the type within the logo. DON’T add any extra elements to the logo. DON’T change the colors of individual elements. DON’T use colors other than those specified in this document. DON’T use the Missouri S&T Athletics logo for any academic purposes. It is reserved for athletics only. Joe Miner is to be used to promote intercollegiate athletics and Missouri S&T’s sports programs in general. Recognized student organizations, student design teams and the Miner Alumni Association also use the Joe Miner image. The image is also used with some student recruitment materials. The image provides entertainment value, as well as high visibility in the community, and fosters a sense of pride among alumni, students and other audiences. Academic and administrative units should not use Joe Miner in their graphic identities because of the image’s close association with Missouri S&T sports, student activities, alumni activities and student recruitment activities. Altering the image of any Joe Miner graphic is prohibited. Altered images of the Joe Miner graphic should not be used in any Missouri S&T materials, including brochures, newsletters, websites and letterhead. The mascot is never to be reproduced, modified or used in such a way as to compromise Missouri S&T’s reputation and educational standards. Such use could result in formal or legal action against the offending individual(s) by Missouri S&T. Vector-based, full-body Joe This version allows for better reproduction than the original hand-drawn image. It can be used in color, in black and white and as line art. In addition to the official pose, a close-up, vector-based image of Joe Miner's head is available for official use. It can be used in color, in black and white and as line art. 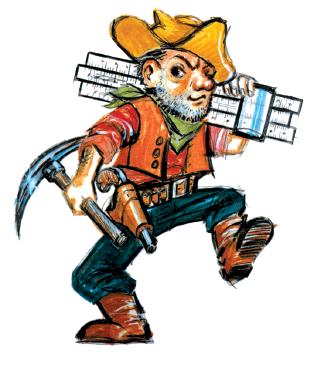 The original image of Joe Miner was handdrawn. It may be reproduced in full color only. Crossed hammers remind us of our founding as the Missouri School of Mines and Metallurgy in 1870. The gear, while signifying our historic emphasis in the mechanics of engineering, also challenges all alumni to pursue new ideas and knowledge, accept civic responsibility, and serve society. The historic emblem may be used with marketing materials that are designed to communicate the university’s history or to communicate with alumni. The historic emblem should never be used in place of the Missouri S&T logo. Its use is reserved for development and alumni relations purposes only. Note: Use of the historic emblem requires authorization from the marketing and communications office. For approval and to request the file, contact marketing and communications at marketing@mst.edu. In order to maintain full legibility, never reproduce the emblem at widths smaller than 1.25 inches (for print) or 215 pixels (for screen). There is no maximum size limit. Ensure that clear space is maintained around the emblem for legibility and prominence. Photos, text and graphic elements must follow these guidelines. Use half the emblem’s width as a measuring tool to help maintain clearance. Missouri S&T's athletics brand identity consists of a family of logos to fit a variety of use cases. The athletics primary mark may be used on all varsity athletics materials, including uniforms, equipment and marketing materials. Note: Use of the athletics primary mark requires authorization from the marketing and communications office. For approval and to request the file, contact marketing and communications at marketing@mst.edu. The horizontal mark may be used when space is restrictive or when a horizontal orientation is preferred. All logo use guidelines in the primary logo section apply to this mark. The S&T mark may be used in informal communications. Consistency is the key to a successful brand identity. It all begins with our name. Our university has a strong heritage of excellence in education and research. Our name is distinctive and mission-based, and reflects our focus as a leading research university. Missouri S&T is what we call ourselves and should be used as the primary name. Missouri University of Science and Technology is our full name. 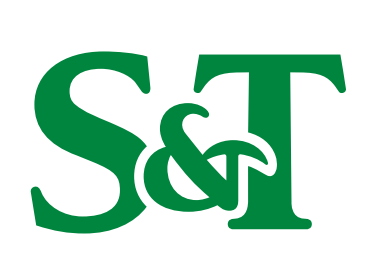 S&T is the only acceptable abbreviation to identify the university. Please don’t use MST, MS&T, MUST, MOS&T or any other abbreviation. The abbreviated university name should be used in official communications to outside audiences or on first reference to familiar audiences (alumni, current students, faculty, staff). The full formal name of the university may be used on first reference in formal, official communications and marketing materials, but should not be used on second and subsequent references. Note: The "and" is always spelled out. Do not substitute the ampersand (&). This shortened version of the abbreviated name is acceptable for use in headlines, photo captions and other tight spots. It is also acceptable in writing about Missouri S&T athletics or occasionally in marketing materials. Acceptable only in web and email addresses in lowercase (mst.edu) and for use in forms on computerized applications in all capital letters that limit the number of characters, such as PeopleSoft.